It was the spring of 1864. Years had passed since the onset of civil war in America and time continued to tear at the very foundations of the nation. Bloodshed saturated the soil, families were ripped apart and nefarious ne'er-do-wells roamed the countryside targeting innocents without mercy. It was a period of relentless suffering yet more heartache was still to be sewn as this War-Between-the-States would not officially end for another year. In south central Arkansas, as with other areas of the country, the Union and Confederate armies were on the move. Echoes of cannons, gunfire and troop movements filled the forests and fields. Even so, on the last day of April, yet another familiar enemy re-entered the front lines. It took the form of threatening clouds and distant rumblings. But, soon enough, the weather would take center stage. As the sky grew dark, lightning flashed and rocketed over the troops, thunder shook the ground and the heavens unleashed a torrent of rain. Walls of water poured onto these war-weary veterans. 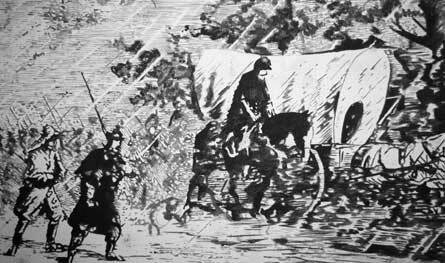 Through it all, thousands of men and mules and hundreds upon hundreds of four-mule army wagons heaved and slogged their way through the old coach road from Camden to Little Rock. It was a massive effort, full of suspense, void of contentment and all about to come to a head at the Jenkins Ferry river crossing. Here, the northern contingency was in a race. A race for time. A race for advantage. A race for their very lives. 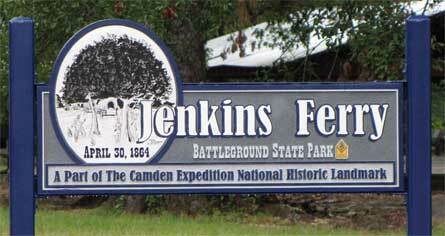 Around them, Confederate soldiers were on the offensive. The Union troops, led by General Frederick Steele, were beating a hasty but hard retreat to their closest stronghold in Little Rock. The going was extraordinarily hard, not just because of the logistics of moving so many men, animals, equipment and supplies but, the three R's of rain, road and river proved to be an especially trying band of antagonists. As the northern troops approached the Saline River and Jenkins Ferry, near modern day Sheridan, Arkansas, the vast numbers of wagons, mules and men fought for every inch of forward momentum. Murky, sloshing water was everywhere. Coupled with the heavy traffic, the route had quickly deteriorated into a miry, slimy pit of tight-gripping, deep-sucking mud. It was as if the road was alive and determined to devour the entire army. Every rotation of the wheels pulled the heavy wagons deeper into the clutching earth. Circumstances were desperate as the hungry, exhausted, wounded, weakened and dying Union soldiers decried the Arkansas landscape. Committed to forward progress, the same men dug, pried, pushed, pulled and strained to keep the vehicles moving. Inevitably, valuable wagons were lost. Some were burned to keep from the enemy. Others were abandoned and, all the while, the Confederates were closing in. Considering the circumstances, keeping the entire train rolling was just too much as too many of these wooden war machines were buried axle-deep in the southern lowlands. Mules, likewise, fought to find a bottom in the road and after many were unhitched from immovable wagons, they often were left to wander as soldiers were desperate to move to higher ground, essential provisions and better fortifications. In August of 2012, my daughter and I had an opportunity to walk part of this same road, referred to today as the ‘military or old coach road'. Surprisingly, after almost 150 years, the trail through the forest is still there, albeit overgrown in some places. We were fortunate to have Roy Wilson, an accomplished and award-winning educator and historian, share a detailed narrative of events as we traveled the historic route. According to Mr. Wilson, the same narrow path was still in use as late as the 1930's by early autos and wagons. More recently, regular visits by interested citizens have helped to keep this place of such dramatic history alive and mostly accessible. 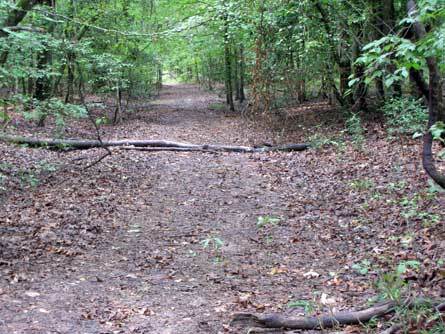 Beginning south of the Saline River and walking a roughly three mile approach to this tributary of the Ouachita River, it was not hard to imagine the experiences of both the Union and Confederate forces on that fateful last day of April in 1864. It was a vision made even easier for us because a few hours prior to our trek, rain had once again inundated the region, leaving behind a slick, soaked, muddy and humid backdrop buzzing with biting insects. Stopping along the banks of nearby Cox Creek, the tranquility of the area seemed equally matched by a sense of wilderness. We could picture soldiers spread throughout the heavy timber and vegetation. Similarly, it's a place where the smell of smoke, continuous blasts of gunfire and a life-threatening sense of urgency can easily be imagined. Ultimately, the retreating Union Army, which included cavalry as well as less than two hundred of the original number of eight hundred-plus wagons, was able to cross the heavily flooded Saline. To avoid being trapped against the river, northern forces set up rear defenses while quickly constructing a pontoon bridge. After narrowly escaping across the makeshift span, the entire structure was destroyed, leaving no effective way for the Confederates to follow across the swollen river. Even without the threats from the southern army, the Union continued to suffer losses of wagons as the north side of the river also claimed its share of vehicles in the saturated ground. As I've shared before in blog posts and feature articles, dead axle (sans springs) work vehicles like farm wagons, freighters and army wagons, are far from simple machines. Extended first-hand experience on the raw terrain they were exposed to not only gives us a more thorough understanding of these vehicles but, greater appreciation for the demands they were expected to endure. As with the army wagons mentioned here, aggressive environments throughout the U.S. racked, twisted, pounded, slammed and violently shook these hand-built frames decade after decade without ceasing. 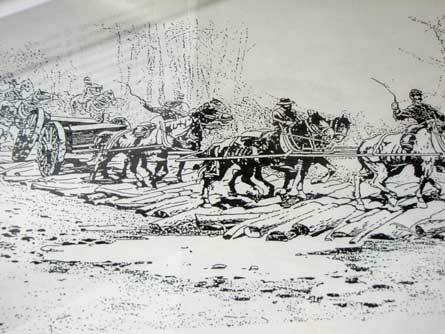 Heavy loads only added to the abuse and, with the attrition of time, few of these Civil War era wagons have survived. Beyond a few sore muscles from the hike, I took away an even greater respect and sense of significance for these military conveyances. In the years since the War, this road to Jenkins Ferry has yielded numerous finds from many of these wagons, burned and otherwise. 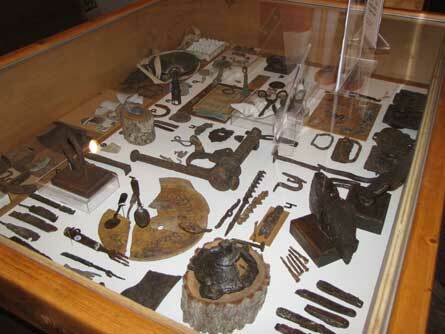 The local Grant County Museum (www.grantcountymuseumar.com) features numerous artifacts from the battle. 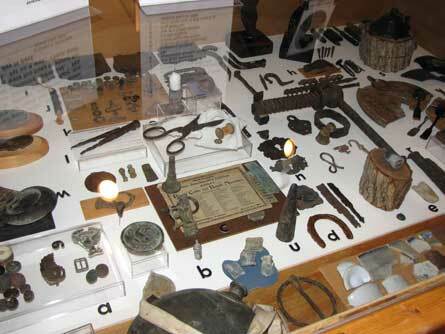 There are recovered mule shoes, vehicle parts, weapons, bullets, nails, food utensils, coffee grinders and more; supplies that were thrown out to lighten the load, a hope against hope; fate-filled wishes that somehow the acts would allow the vehicles to levitate over the boundless muck. For me, the tour led to the acquisition of a lone bow staple; brittle, worn and heavily rusted; A relic from a time when the foundations of our nation were tested, families were torn and the future seemed anything but triumphant. 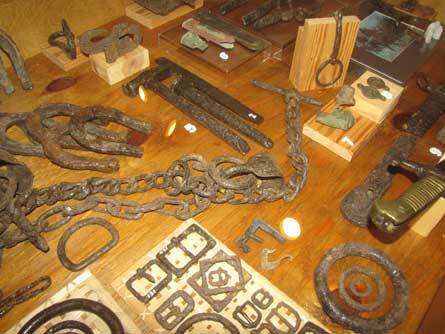 It may have traveled thousands of miles and clearly was part of a great deal of brutal history. Thank you to Mr. Roy Wilson for the trip, his time and for his gift of the historic bow staple. It's a fixed reminder that our time on earth is fragile but every road we travel can have lasting and memorable effects.